We recognize him as our sharply dressed, cigarette-smoking tour guide of The Twilight Zone, but the entertainment business once regarded him as the “Angry Young Man” of Hollywood. 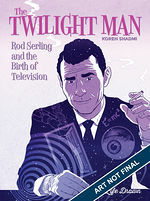 Before he became the revered master of science fiction, Rod Serling was a just a writer who had to fight to make his voice heard. He vehemently challenged the networks and viewership alike to expand their minds and standards—rejecting notions of censorship, racism and war. But it wasn’t until he began to write about real world enemies in the guise of aliens and monsters that people lent their ears. In doing so, he pushed the television industry to the edge of glory, and himself to the edge of sanity. Rod operated in a dimension beyond that of contemporary society, making him both a revolutionary and an outsider.